Communications Transport Specialists store, transport and deliver hi-tech communications equipment on Royal Signals deployments and exercises at home and abroad. Join us and you'll be trained to drive specialist vehicles of all sizes in tough conditions, getting technical equipment where it needs to be to keep front-line units in touch with senior commanders. Take responsibility for a diverse range of highly technical communications equipment. Get a lot of responsibility early on, taking ownership of entire regimental accounts. Gain specialist driving licenses in training, from forklift trucks to HGVs and a hazardous materials qualification. Start an apprenticeship straight from training which can progress to a qualification with Lincoln University. Develop both driving and storekeeping skills throughout your career. After basic military training you’re trained to drive cars and large goods vehicles with a trailer. You also learn about moving hazardous materials and stores accounting. 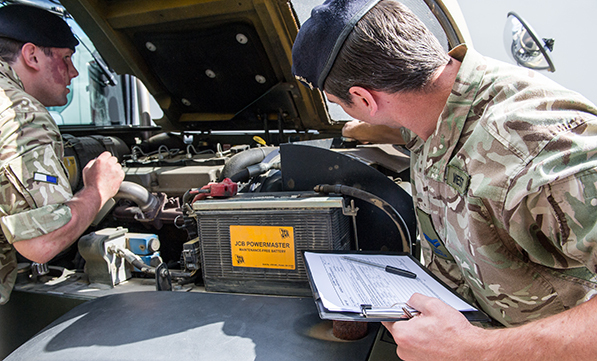 Training earns you a host of driving licences and technical qualifications, which opens up new job opportunities in the Army and beyond. "My trade provides a wide spectrum of opportunities, which can vary day-to-day and posting-to-posting. One moment I could be maintaining the large number of military and civilian vehicles within the MT (Motor Transport) department, and the next providing stores and high tech equipment which different Regimental and Brigades may require to support them whilst out on exercise. Where ever stores or vehicles are, I am as well – this could be anywhere in the world, in all conditions!"